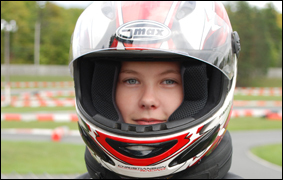 Liesl has her first year of competitive karting behind her and she's looking forward to racing in the Canadian Rookie Karting Championship (CRKC) in 2017. This year, she'll be focusing on improving different skills and overall racecraft. Her ability to gain position and defend her position are strengths that have served her well and she'll be looking to improve upon them. Liesl will also be looking to add race strategy to the mix. By improving existing skills, adding new skills to the mix with the addition of strategy, we hope to see Liesl up on the podium in 2017. * Liesl's kart suffered a mechanical failure and she was unable to complete qualifying.